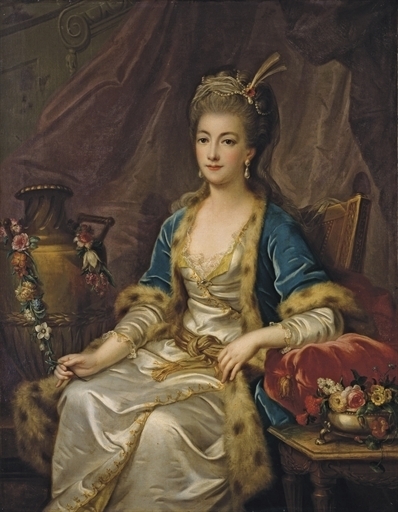 The last major piece of my take on Guimard's 1790 Turkish stage costume was the fabulous fur-trimmed blue robe. I pondered over this piece for a long time, trying to decide just what it was. In actual Turkish dress, the long fur-trimmed robe was known as a kurdi, a fairly geometric pattern. 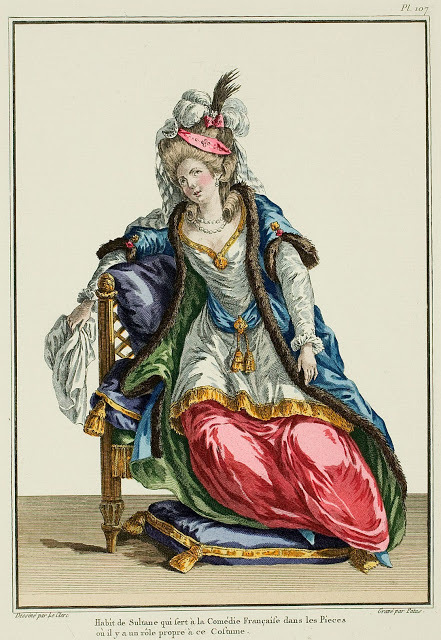 You see this kind of fur-trimmed robe worn by Turkish men and women, but appropriated by European men and women in a variety of colors, though blue seemed particularly popular. 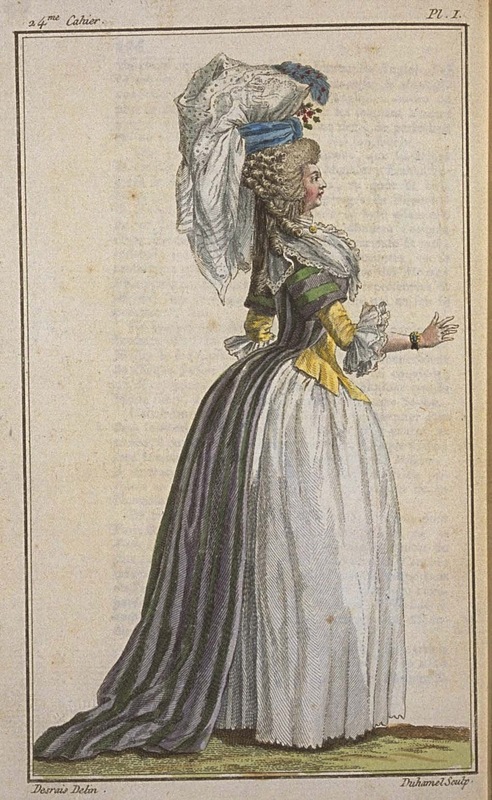 Cabinet des Modes, November 1786 - this is a fashionable "Robe a la Turque" - you can see they've take the short, broad sleeves but the cut of the robe is very trim through the back, unlike a real Turkish kurdi, which fit very loosely. 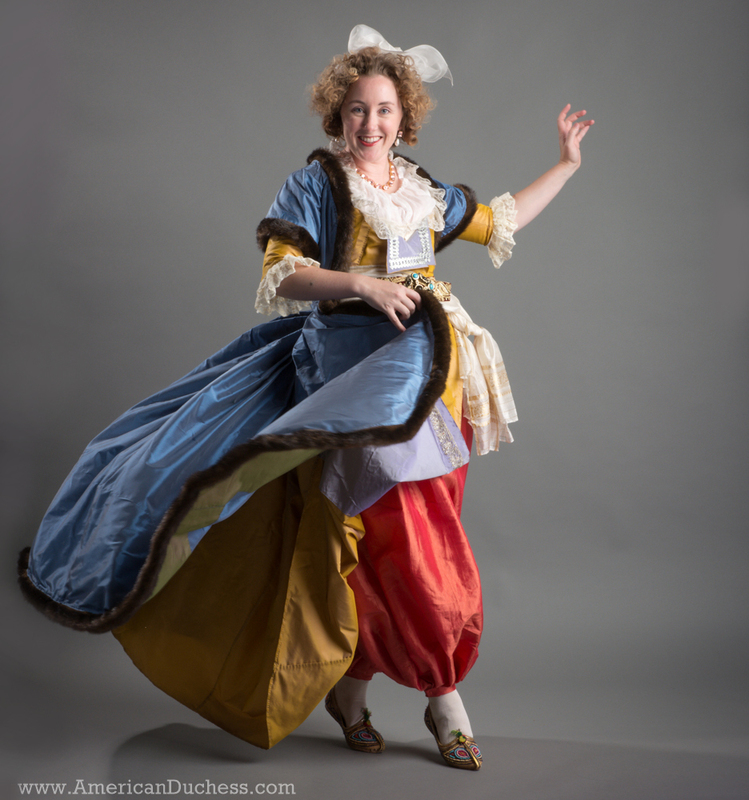 Through the lens of the 1790 mantua-maker, I decided to cut this robe like a Polonaise and construct it like a man's frock coat. I chose this path because I thought this is how a French dressmaker would go at a project like this, having little or no experience with actual Turkish dress. I also wanted a more fitted back and the possibility of wearing this robe in a less theatrical way later on. I made a mistake in trying to construct the kurdi as I thought a mantua-maker would. Instead I needed to do it in the tailor's way, which I had no experience with (of course!). 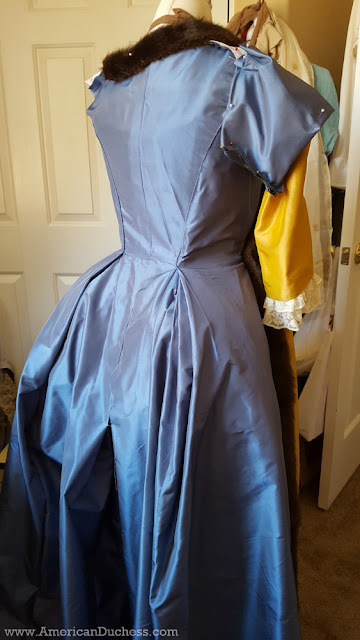 Trying to follow the typical steps of assembly for a close-fitting gown just didn't work, and I had to re-do several seams as well as figure out the stacked box pleats at the back. This project was a strong lesson in how these two trades differed. The robe going together - I later had to pull out the side back seams and stitch them with a different method to make the stacked box pleats work. 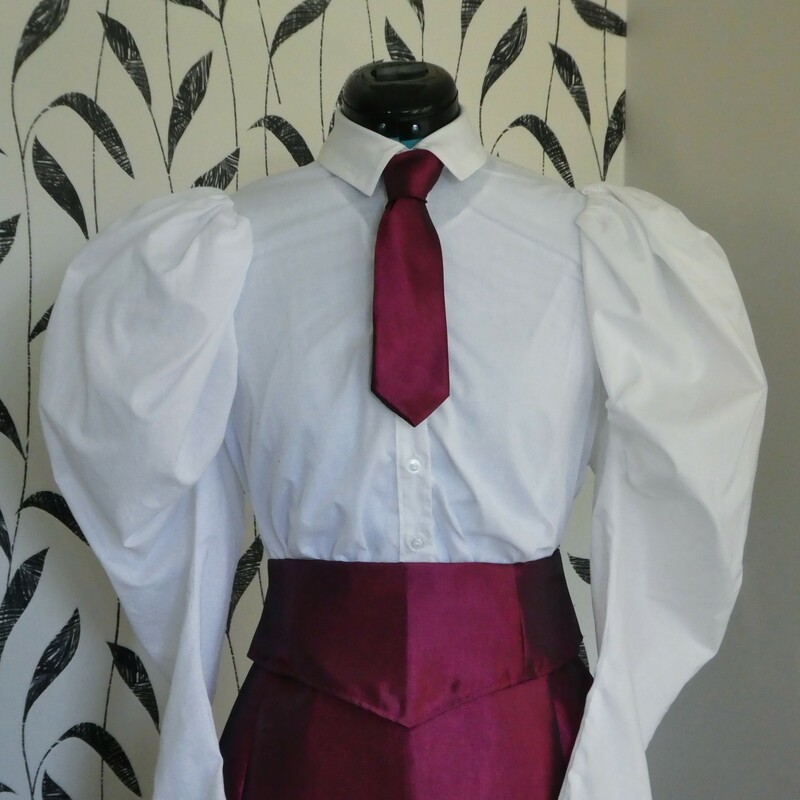 The sleeves were very large tubes with only a little shaping at the top and underarm. 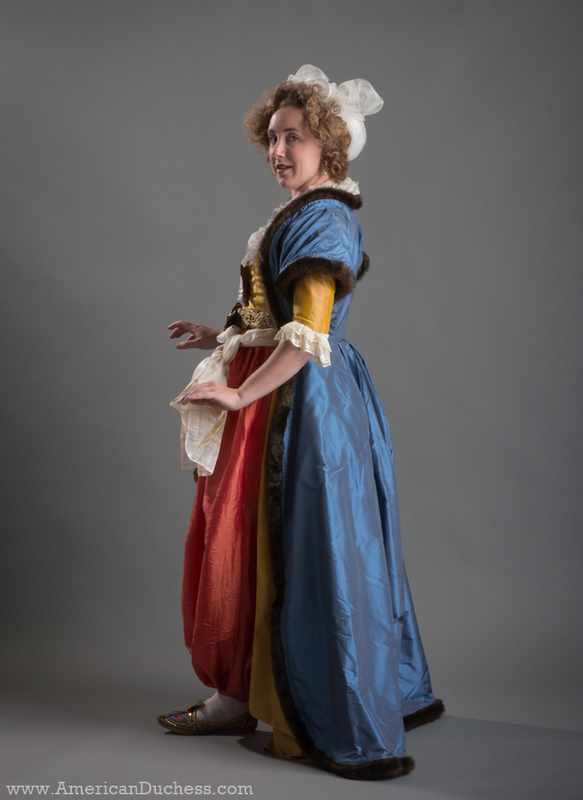 We set them on the body like regular 18th century gown sleeves. Construction of the robe was one thing, but what really made it ridiculously tricky was the #Fursnake. Ladies, be warned - a fur roll edging a garment is *really* hard! Making the fur roll itself isn't so hard. 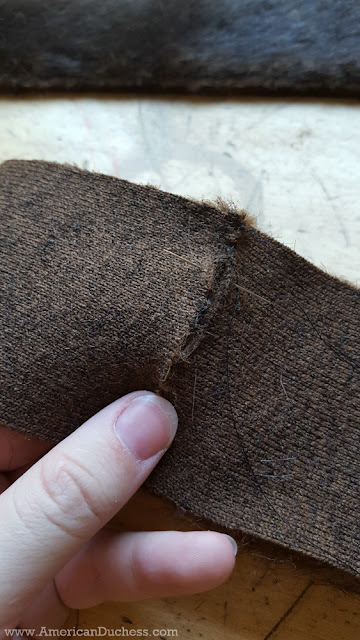 I cut strips of my faux fur, joined the seams, then folded it in half, matching the raw edges. Abutted edges of faux fur to make a seamless join - this is how you get the length. Folding the roll in half long-ways, then whipping the edges together. Because I was using faux fur, I thought I could get away with just whipping the raw edges together, but I ended up having to bind those edges with tape because there has to be something to catch the outer fabric and lining to. 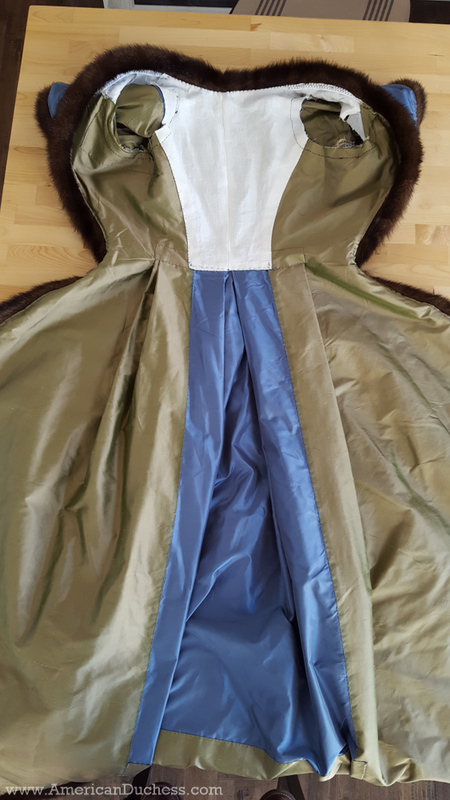 There was a great lot of shearing of the fur along the edges before binding it, and it was a struggle made significantly harder by using faux fur because of the bulk left on the edge, even with the trimming. 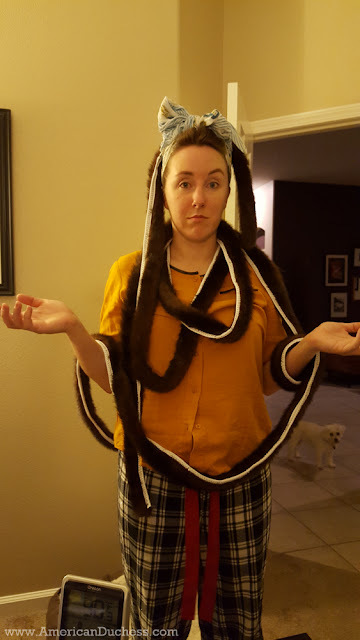 Once the fur roll was made, applying it to the edge of the robe only got harder. 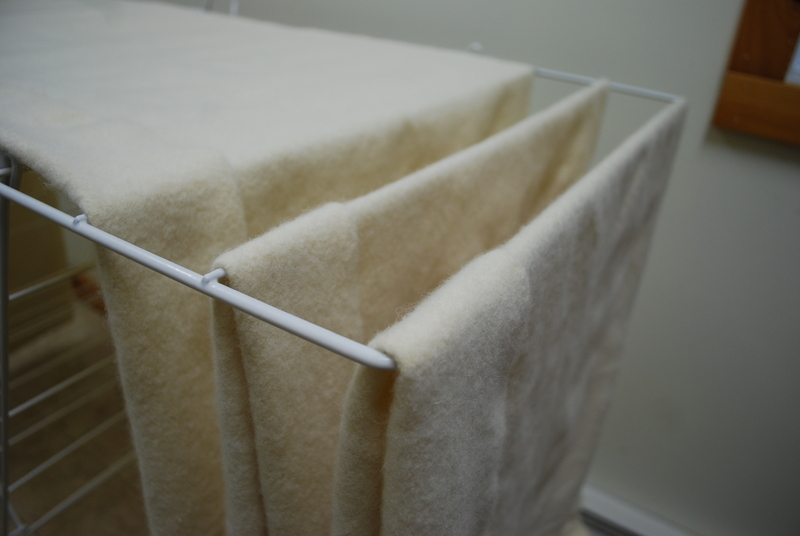 Unlike a fur guard that is applied to a finished garment, a fur roll has to be set between the outer fabric and the lining during construction. 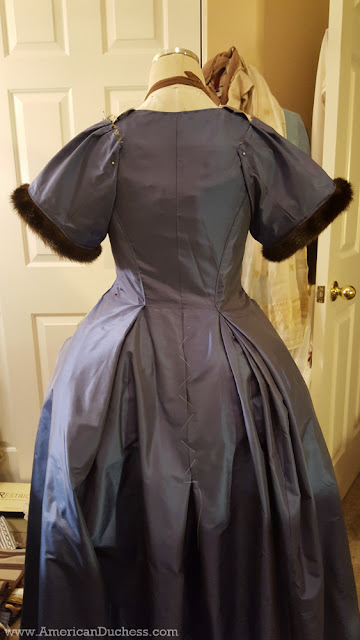 On thin taffeta this was very challenging, and I was thankful that the cheap silk lining I used had enough body to stabilize the edges and support the weight of the fur. I still had to handle the garment very carefully before that lining went in - the last step. 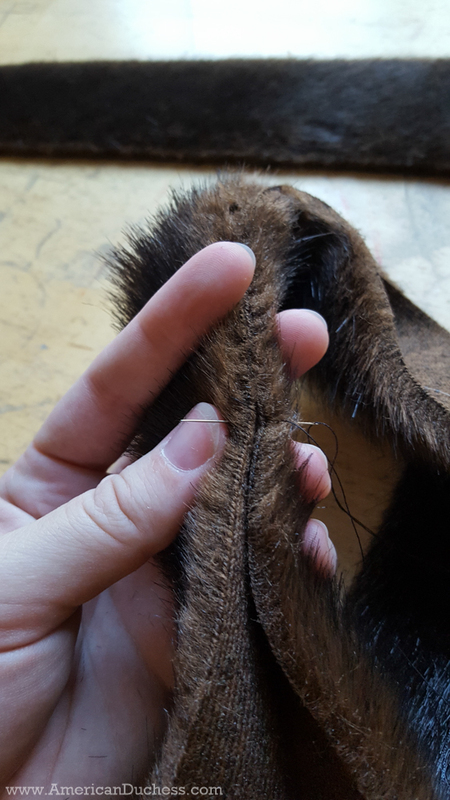 Setting the fur roll to the robe edge. 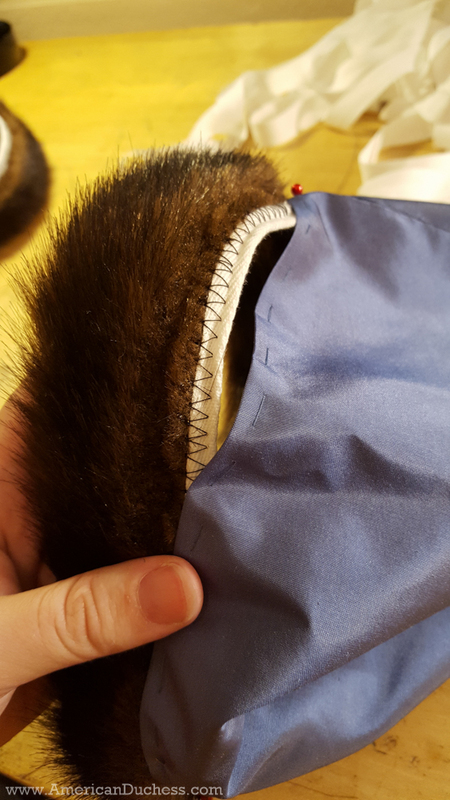 I turned and basted the edge of the taffeta first, then top stitched through to the fur roll, catching the binding. To be honest, I'm actually surprised at how well the fur edge came out given what a struggle it was to install it. I'm very happy with the result, though. I thought it would be more economical to half-line it, but in hindsight it would have been less work to just fully line the robe. I had to cut a separate guard for the hem in the back and secure it with a line of fine stitches across the top. It worked fine in the end but could have been avoided. Working flat on a big work surface was the only way to make this work without bubbled between the outer and lining fabric. 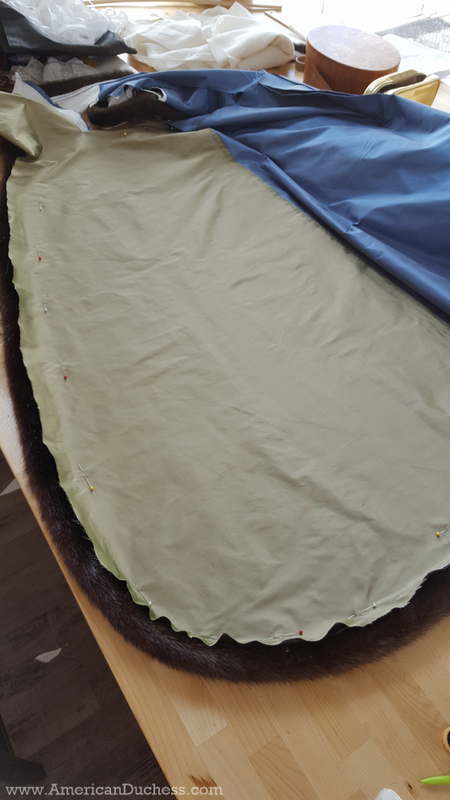 Lots of pins, then carefully turning under the edge and top stitching just enough to catch the bound edge of the fur roll but avoid the outer fabric. The inside of my kurdi - halflined in green silk. 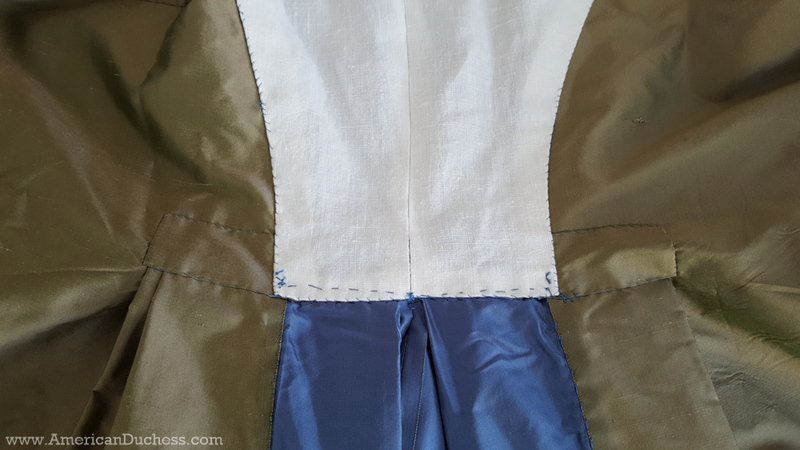 The back of the bodice is lined in sturdy linen. 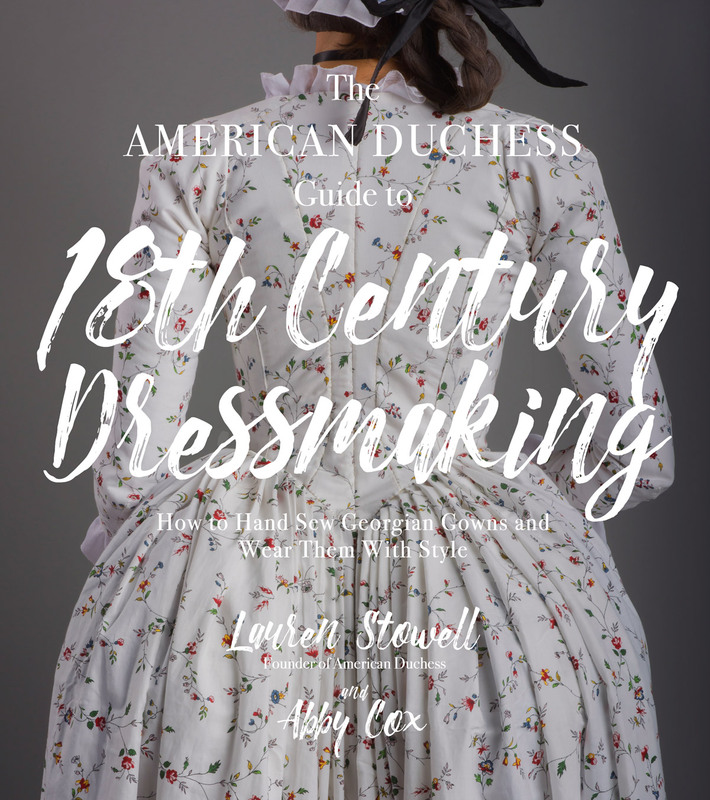 The sleeves were set in like a woman's gown and the armscyes left unfinished. The junction of the stacked box pleats and the waist - tricky. There are lots of stitches here securing everything together. 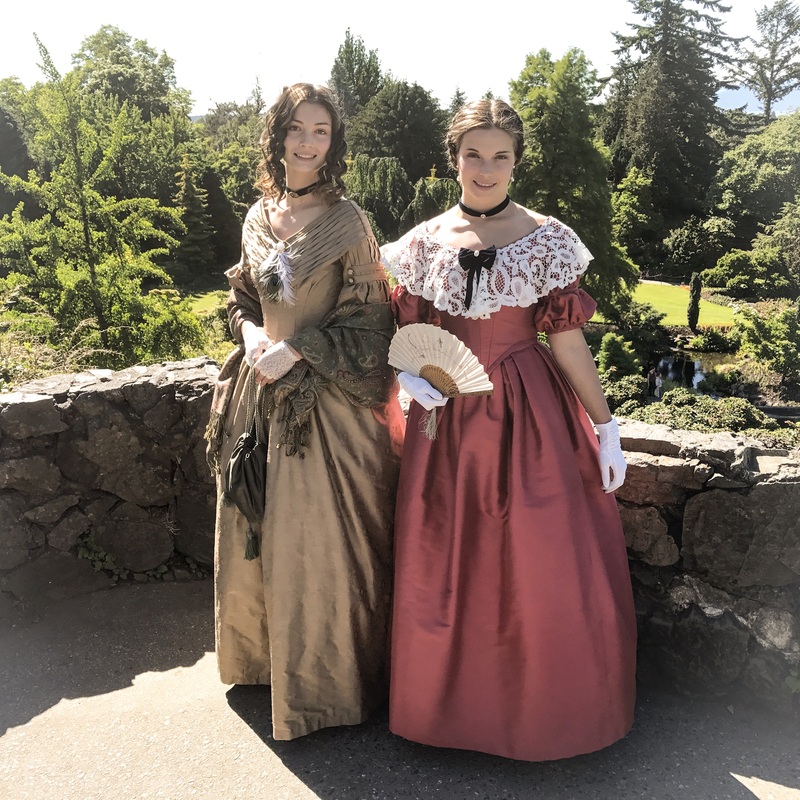 One way to keep these pleats secure is by stitching a decoration such as a button or a piece of braid trim on the exterior, both commonly seen in Polonaise and Turque gowns. All in all, the kurdi robe came out great. 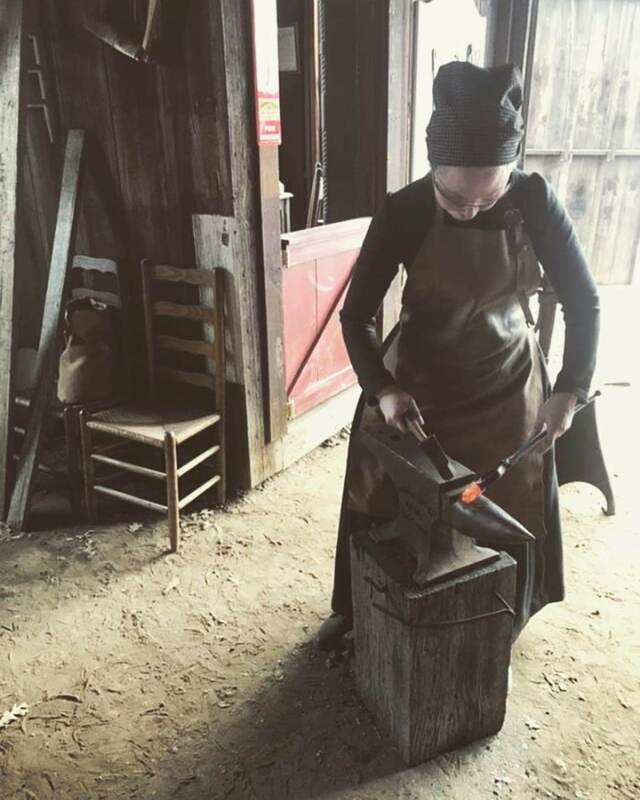 Though it gave me such trouble, I learned a lot about tailoring. The most difficult garments, when complete, often give us the most pride, and I am indeed very pleased with this piece. I look forward to styling it in other ways, with other pieces to create different looks. I wore the kurdi loose over the other pieces of this ensemble, with no additional pinning at the neck or waist and worn over no underpinnings. I intend to try this robe in a fashionable European way worn over a split bum and with the skirt looped up. Fabulous! 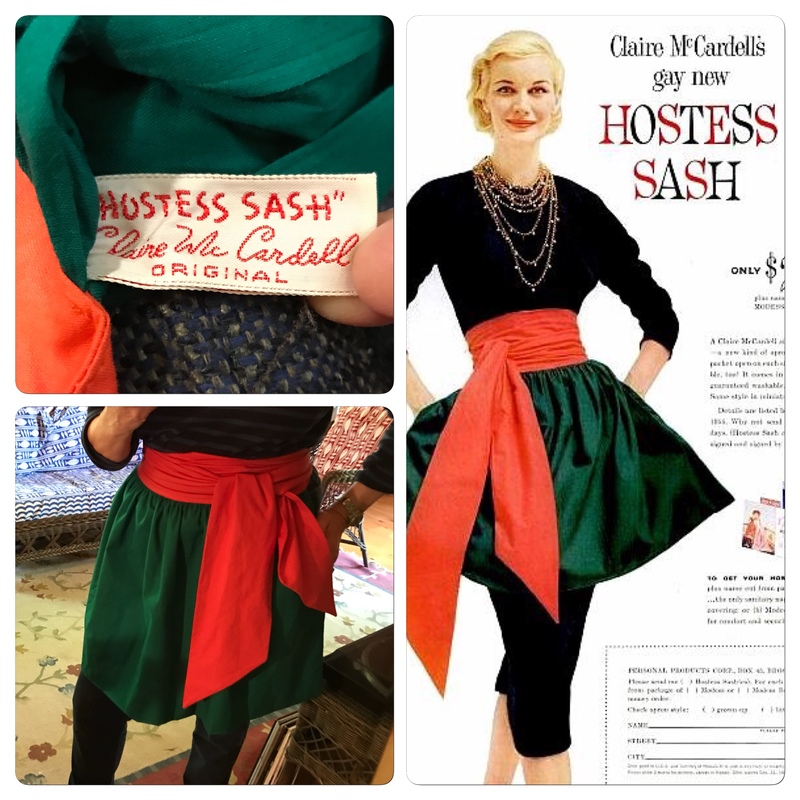 Thanks for taking us all along on your process- it was fun seeing how you made this outfit come together! The first photograph--with the kurdi swirling--is especially impressive. Thanks for an informative essay (as usual). Now back to the topic, it turned out wonderfully - all the hard work has been worth it. 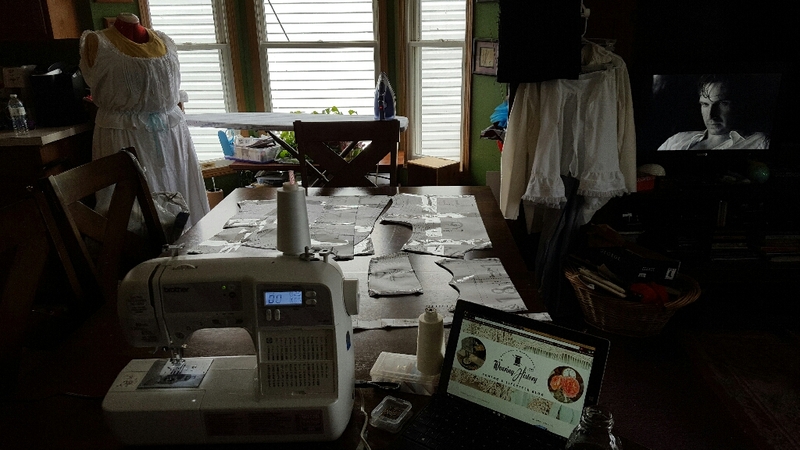 Do You hand sew all of your reproductions? From the photos it looks as if you do. If so, are there any issues with the stitching not holding up to the weight of your fabrics? 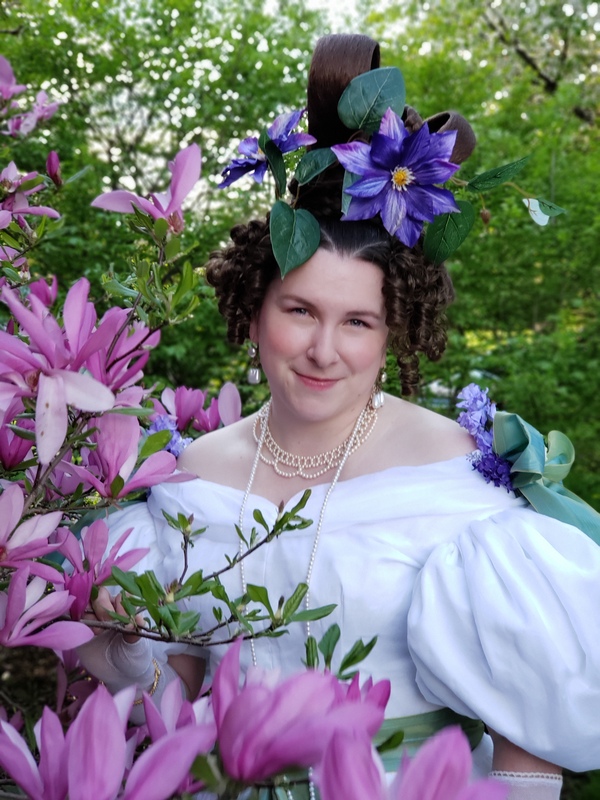 Yes, I do hand sew all my 18th century gowns now. I don't have issues with stitching vs. fabric weights, but I don't use heavy fabrics. 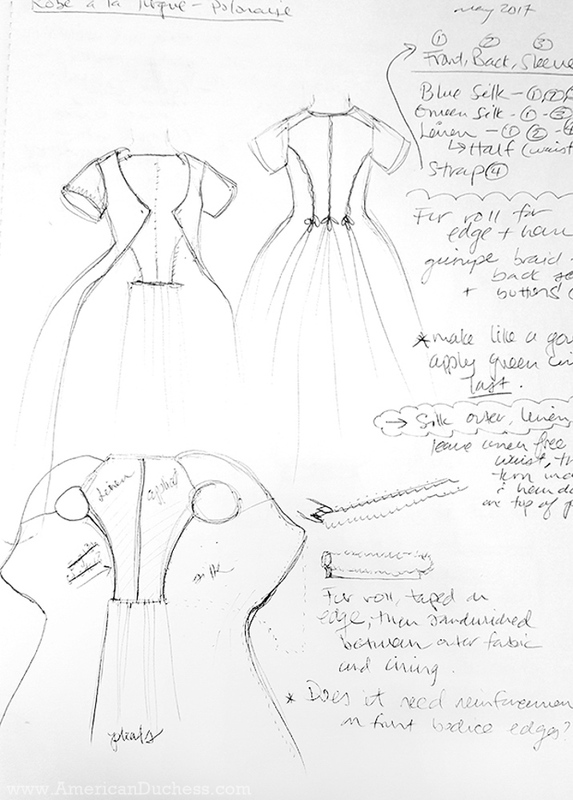 Silk taffeta or light cottons are usually what I make dresses from. 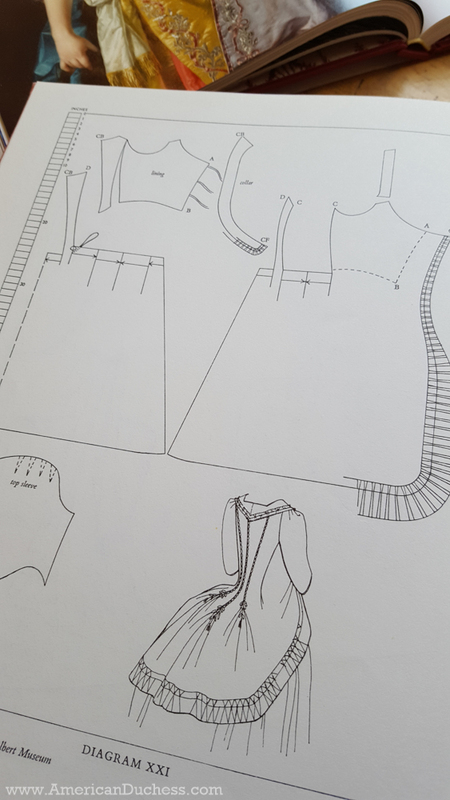 If the gown fabric is a heavier wool, though, I just make sure to use the right stitches and thread weight for stress-bearing seams. I love this! It is so much fun, so rich and gorgeous. You look so gorgeous in this, I'm surprised that you ever take it off! I have also been fascinated by this portrait for years and used it as inspiration for an early 19th century version last year. Passed on the trousers for practical reasons and used real fur that I had for years for the trim. 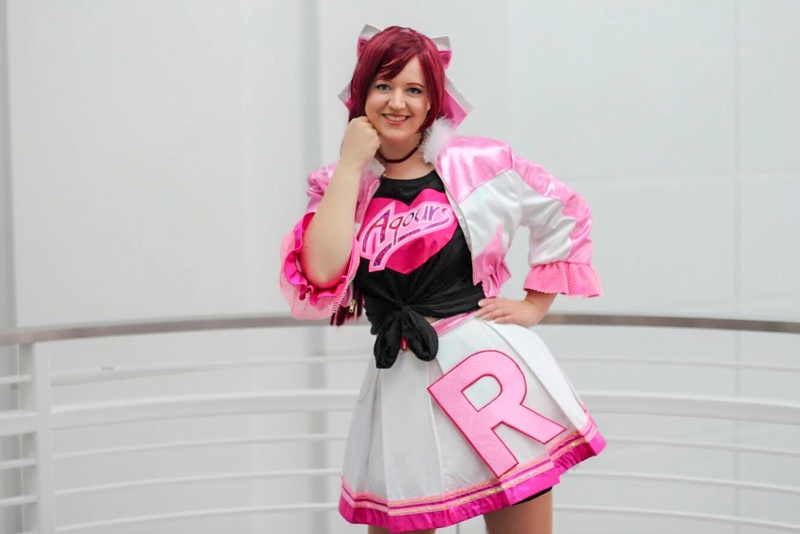 I do think the jury is out on whether this was really stage costume, but I suppose that is a reasonable assumption.